Yakuman DS (役満ＤＳ) is a mahjong game for the Nintendo DS. It's produced by Nintendo itself, benefactors of such games as Super Mario Bros. and Donkey Kong. Mahjong is a traditional game that came from China. What makes this game special is that it features various Mario series characters. The game was released only in Japan in 2005 by Nintendo. 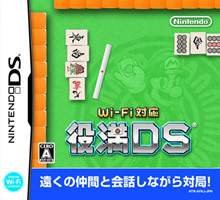 One year later, Nintendo re-released the game in Japan with an Online mode, with the name of Yakuman DS with Wi-Fi (Wi-Fi対応 役満ＤＳ). Naturally, the character the player has chosen will not be available as an opponent. Free mode- In free mode the player can freely choose CPU opponents to play against. Challenge mode- Win by fulfilling a given set of conditions with a given set of opponents. Easy, normal, and hard challenges are available, with Wario and Waluigi being unlocked after completing all the Easy challenges. Ranking mode- The character chosen starts at rank 20. He/she plays against the other characters to ascend and possibly become rank 1 (top 3 opponents are Petey Piranha, Bowser, and Toadsworth in ascending order). Note that the ranking system works by winning points from beating other players; thus, the top opponents do not need to be unlocked in order to ascend above them. Local multiplayer- A game for multiple players (up to 4), all within range of the DS wireless radio. Online multiplayer- Like online multiplayer for other DS games, with the same Friend Code system. Voice chat is available.